Many horses are affected by hoof abscesses but what exactly are they? Put simply, a hoof abscess is a localised bacterial infection confined to the delicate structures of the hoof. Facing infection, the body produces purulent fluid (pus) to try to isolate and control the infection. Pus consists of dead white blood cells that have been assembled by the immune system to ward of the bacteria. Abscesses of the hoof are particularly painful because of their location; since the hoof cannot expand, the presence of an abscess causes extreme pressure and discomfort. Hoof abscesses are usually found in the sole of the hoof but can occur elsewhere. They are the most common cause of acute lameness in horses and ponies and should be treated with haste. Abscesses are caused when foreign matter gains entry into the hoof. This either happens through a fissure or break, a puncture from a misplaced nail, or via old nail holes in the hoof wall. Sometimes, a sharp, penetrating object can enter through the skin surface and cause an infection. Likewise, an open, untreated wound can quickly become riddled with bacteria and form an abscess. The hoof may have an existing infection that is rearing its head and causing problems. Crucially, if the abscess is not treated in good time, it can rupture and release pus. Most abscesses begin with bacteria entering the sole-wall junction because of surface penetration or weakening of the hoof. If moisture gets inside the hoof, bacteria can thrive. 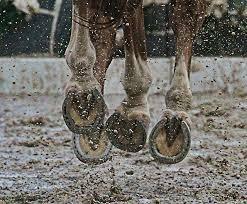 In muddy, wet conditions, small fissures in the hoof can facilitate the spread of bacteria. Fissures can occur when the hoof dries out in warm conditions and then shrinks, causing new cracks to appear. When the weather turns wet again, these cracks can soften and fill with bacteria. For this reason, it is essential the stable is always kept clean, dry and free of manure to decrease the chances of infection. Penetrating wounds are also a leading cause of hoof abscesses. Anything from a rock, nail, or a piece of glass can introduce bacteria to the foot. When perforation of the sole occurs, it usually takes 2-4 days for an infection to take hold and an abscess to form. If the farrier places a nail too close to the sensitive inner structures of the hoof, or, if a nail is inserted and then removed and re-positioned, bacteria can easily gain access to the hoof through the empty crevice. It is recommended that all empty nail holes be flushed out with dilute antiseptic solution for 3-5 days to prevent infection. If the conditions are particularly wet or muddy and your horse is turned out, it is probably best to wrap the hoof while the nail holes are healing. Sterile abscesses (not caused by infection) can arise if a shoe is hot-fitted to a thin sole. The sensitive hoof tissues can suffer thermal injury in this incidence. Be careful what you are using on the hoof, especially for hoof repair, as heat producing materials can irritate and worsen existing infections. Sometimes, there is no obvious cause for a hoof abscess and you are none the wiser as to why it developed. How do I know if my horse has an abscess? If your horse appears acutely lame, chances are it has a hoof abscess. Most horses afflicted with this condition can bear no weight on the problem hoof and will show visible signs of pain and discomfort. Simple activities such as walking and standing become next to impossible for horses with abscesses. Again, if the hoof or limb feels particularly warm or has an increased digital pulse, hoof-related problems should always be considered. The affected limb may also appear swollen and the horse may have a fever. If any of these symptoms are noticed, it is important to enlist the immediate help of your veterinarian. As the abscess progresses, the infection will painfully work its way up the hoof wall before bursting - either out of the coronary band, the bulb of the heel, or the sole of the foot. How are hoof abscesses treated? Sometimes hoof abscesses heal of their own accord, although due to their painfulness and how much they affect mobility and quality of life, veterinary intervention is often warranted. If the horse is shod, the shoe is normally removed to allow better access to the hoof and sole of the foot. Once the abscess has been identified, the veterinarian on hand will make a small incision through which to drain out the pus. If, on the other hand, the abscess is too deep in the foot to reach or risk incising, then the only option is to leave the abscess until it bursts of its own accord. If the infection is inside the heel or frog, it may do more harm than good cutting into the skin to insert a line. Waiting until the abscess has worked its way out of the coronary band will take longer and cause your horse more pain, but direct intervention to drain the abscess could result in far bigger problems for your equine's future health and mobility. Whether the abscess is drained or not, it is vital that you keep the hoof clean and protected as much as possible. Applying a poultice to the affected hoof/limb will ensure the foot is protected while it heals. It is generally recommended that you apply Epsom Salt directly to the hoof to draw the abscess out and encourage the infection away from the hoof. After applying the poultice, wrap the foot in a cushioned boot to hold it in place and expect to wait up to 4 days for recovery.